The latest GTA Online update includes a mobile command center, client jobs, and a jet-engine powered motorbike. GTA Online has been offering weekly updates with new content since the After Hours expansion launched last month. This week is no exception, but there’s one especially notable feature: An upgraded version of the Oppressor hyperbike. The original Oppressor was a rocket-powered motorbike that quickly became a fan-favorite. The Pegassi Oppressor Mk II is a new model with a freaking jet engine strapped underneath. If you need to get somewhere in a hurry, odds are the Mk II will get you there. And that’s just one feature: Tomorrow’s update also includes the Benefactor Terrorbyte, a custom command unit that can be deployed just about anywhere. Its “Nerve Center” includes turret, drone, and missile battery stations, along with a Vehicle Workshop that can be used to customize the Oppressor. The Terrorbyte computer also provides access to six new Client Jobs. You missions will include hacking secure data, acquiring jewelery, and robbing money that was successfully stolen by bank robbers. Both the Opressor Mk. II and Terrorbyte will be available on August 14, 2018. You can locate them from the inventory at Warstock Cache and Carry. 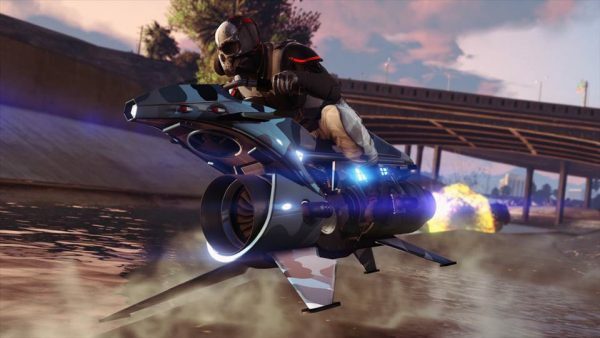 The post GTA Online update includes new version of Oppressor hyperbike appeared first on VG247.